This entry was posted on April 11, 2019 by chris elliott. Any wooden or bamboo floor will need time to adjust to its surroundings before installation. This process is called ‘acclimatisation’. It helps the bamboo flooring planks or blocks to adapt to its new surroundings. It also helps to reduce the risk of movement and damage after it has been installed. Why do I need to acclimatise my bamboo floor? Bamboo is a natural product, which will naturally adapt and adjust to changes in its environment. Fluctuations in moisture, temperature and humidity will cause the bamboo to naturally swell and shrink. When there is more moisture in the air, the bamboo will absorb this and start to expand. Alternatively, when the air is dry, the bamboo will lose moisture and shrink. Expanding and contracting is very natural for bamboo. The changes are very minimal and nothing to worry about, as long as you have prepared and installed your bamboo flooring properly. Acclimatisation is necessary to allow your bamboo to expand or contract to its new environment. Once it has been installed it may not have sufficient space to do this, so it is vital that you allow the flooring to adjust. Acclimatising your bamboo floor is simple. 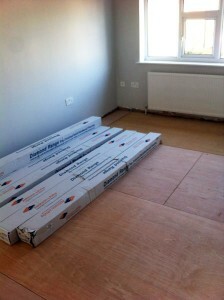 Be organised - arrange for your bamboo flooring to be delivered to the property it is going to be installed in. Leave plenty of time to allow for it to adapt to its surroundings before you start the installation process. You should leave the flooring in its unopened boxes. They need to be in the room or area where the flooring is due to be installed. With a concrete subfloor, you should raise the bamboo off the floor using batons. Please check that the room is fully dry – your bamboo flooring should not be left on a damp floor or in a room with damp or wet plaster on the walls or ceiling. The relative humidity in the room should be between 45-65%, with an ambient temperature of between 17 – 22°C. Do not leave the bamboo flooring directly next to any heat sources, like radiators or portable heaters. Finally, leave your new bamboo flooring for at least 48 hours before you begin installation. For further information, please read our Acclimatisation and Storage Guidelines.